It carries the number of symbols that can be used for control channels (PDCCH and PHICH). It is 16 data subcarriers of the first OFDM symbol of the subframe. PCFICH data is carried by 4 REGs and these four REGs are evenly distributed across the whole band regardless of the bandwidth. The exact position of PCFICH is determined by cell ID and bandwidth. 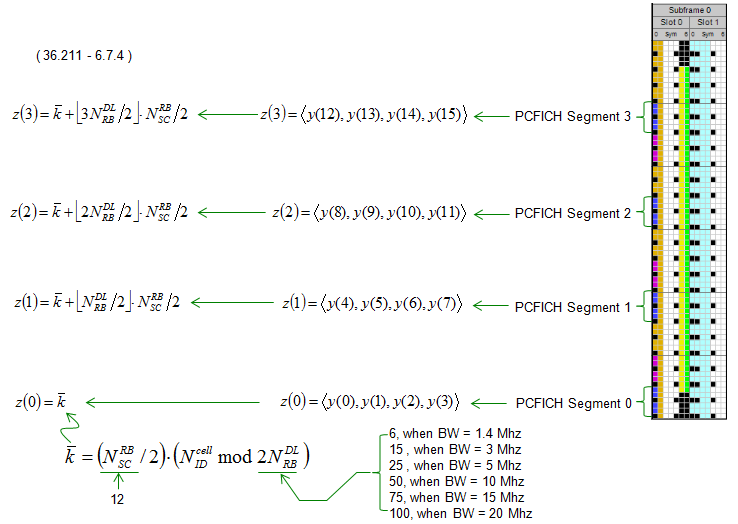 The steps to process PCFICH (Converting CFI into physical symbols) is illustrated as follows. If you are interested seriously in details of physical layer channel processing, this can be one of the good place to start. It is much simpler than PDSCH or PBCH processing, but still has all the essense of channel processing. If you want to have some hands-on this process and visualize the final result of this process, refer to Matlab : Toolbox : PCFICH. Regardless of System Bandwidth, PCFICH is always carried by 4 REGs (16 REs) at the first symbol of each subframe. The exact location of these four REGs for PCFICH is determined by Physical Cell ID and System BW according to formula as shown below.